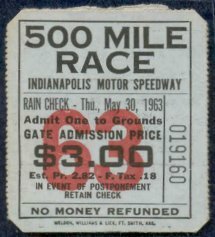 The 1956 ticket continues with the previous years winner and winning car depicted. 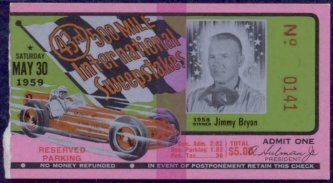 It is the same **dimensions (5 1/8" x 2 1/2") as the 1955 stub. 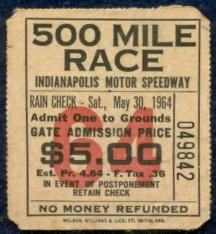 Tony Hulman's name does not appear nor does any one else on grandstand tickets for 1956. 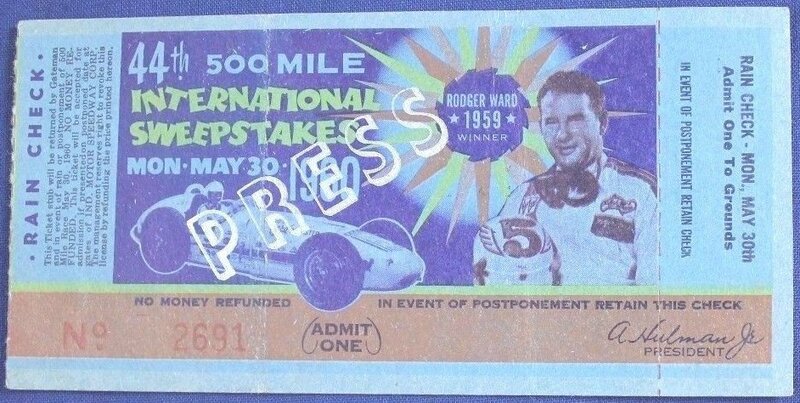 Note that on the "Press" ticket there is a diagram of the track on the back where as the "Complimentary Employee" remains blank as in previous years. General admission tickets remain 2" x a little over 2 1/4". The ticket maker remains "Weldon, Williams & Lick, Ft. Smith, Ark.". 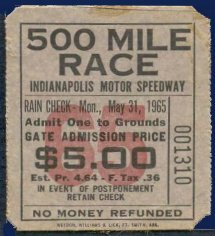 This may be a replacement grandstand ticket but as this is the only example of this type, it is unclear why this was issued. 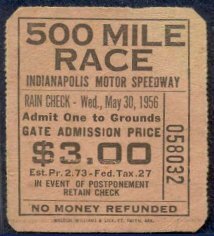 Tony Hulman's name re-appears on grandstand tickets and remains so through 1976. Note that the 1959 reserved parking stub has a serial number and a track diagram on the back as do the 1960, 1961 and 1962 while the 1968 general admission has a serial number but is blank. It is unclear what the "S" at the center signified. This is the only year* a square general admission ticket appears this way. Stubs from 1956 through 1975 become easier to obtain as the you go up through the years. If one had to chose which one or ones are tougher to find than another, the 1967 and 1973 with rain checks would rank near the top, then 1956 on up.